Burger King started a social movement with “Whopper Sacrifice”, a Facebook application designed to publicly document brand loyalty. On January 8, 2009, visitors to the Whopper Sacrifice site, whoppersacrifice.com, were invited to sign up for the Facebook application and choose ten of their Facebook of their friends to sacrifice in exchange for a free Burger King Whopper hamburger. 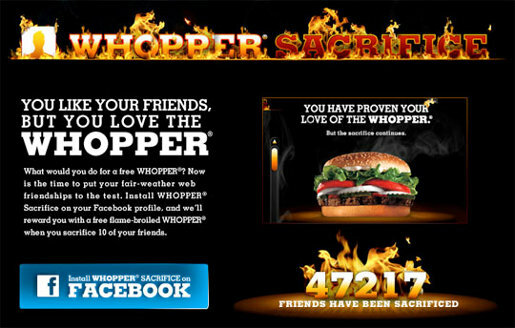 A week after the Whopper Sacrifice campaign was launched Facebook disabled WHOPPER® Sacrifice, citing concerns over breaches of privacy associated with the sacrifices of 233,906 friendships. Here’s one Whopper fan documentation of Whopper Sacrifice of Facebook friends. The Whopper Sacrifice campaign was developed at Crispin Porter & Bogusky by executive creative directors Andrew Keller and Rob Reilly, interactive executive creative director Jeff Benjamin, creative directors Bill Wright and James Dawson-Hollis, associate creative directors Nuno Ferreira and Neil Heymann, interactive designers Pelun Chen and John Whitmore, copywriter Joel Kaplan, programmers Jimmy Pino and Robert Christ, art director Saman Rahmanian, flash designer Andrew Kennedy, integrated head of interactive production Winston Binch, executive integrated producer Robert Valdes, integrated producer Rob Allen. Working at Facebook specialists Refresh Partners and Ascent Marketing Partners, were technical director Scott Prindle, associate technical director Mat Ranauro, interaction designer Matt Walsh, technical lead Oscar Llarena. CG burn, fire and smoke effects were produced at Hook Studios. The Whopper Sacrifice campaign won Gold for Web Applications and the ADC Hybrid award at the Art Directors Annual Awards 2009, Grand Clio for Fresh Approach and three Gold awards at the CLIO Awards 2009, a Silver for Innovative Media at the One Show 2009, a Gold at the International ANDY Awards 2009, and a Yellow Pencil for Online Advertising and Digital Innovations at the D&AD Awards 2009.